A Luxury Resort for an Unforgettable Wedding in Italy. When an eleventh-century fortress perched on a rock overlooking the Tuscan countryside is meticulously restored respecting the original architecture and enriched with the most innovative comforts, it becomes the most enchanting place for a wedding in Italy. 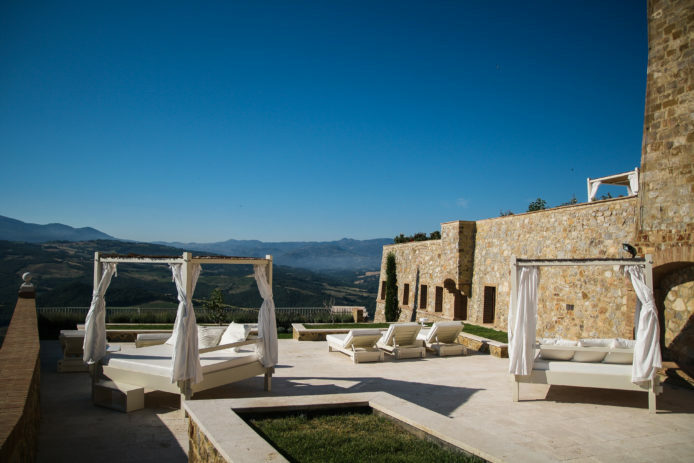 Located near Montalcino, this castle was transformed in the late ’90s into a luxury spa, which finds its strength in the impressive landscape that surrounds it made of uncontaminated hills, endless expanses of vines and olive trees, magnificent abbeys and towns rich in history, art and culture. Yet it is not only the view that makes this castle a location of excellence, but the attention to detail: the outdoor pools for unforgettable spa baths in the moonlight, the ancient cloister covered by a crystal dome where to sip a good distillate under a quilt of stars, a high-class Spa able to calm the mind and body with a rich range of treatments. The castle can hold up to 120 people, who will be able to find room in the many accommodations of the building, choosing between the rooms and suites of the original portion of the stronghold featured by vaulted ceilings, large decorative fireplaces, tile floors and marble bathrooms, or those with more contemporary design of the new section Spa, decorated with fine materials, bathrooms with thermal water and large windows to not miss a single detail of a landscape of haunting beauty. The eleventh-century castle is located near Siena and is perfect for those who dream of a lavish wedding in the Tuscan countryside replete with thermal baths and wine tasting. Find out all the other enchanting castles for a fairytale weddings!